Pinterest is a very dangerous place. You can find so many recipes and fill your boards up with 100s of desserts. Thankfully I think my dessert board is only almost reaching 100 pins so I’m not too bad. However, Pinterest makes it super easy to find a recipe, way too easy. Yesterday, I really wanted to make something sweet so I went and browsed my Pinterest dessert board. After looking at a couple I chose to make Oreo Cream Filled Brownies. I’d never tried them before but they looked good and we had everything on hand to make them. These brownies were super easy to make. The brownies smelled really good when they came out of the oven but we had to wait a while for them to cool. Once they were cool I whipped up the filling. The filling tasted really sugary when I had a spoon of it plain, but it wasn’t too sweet in the brownies (it’d also make great whoopie filling too). And as you can see it looks real pretty once it got filled. 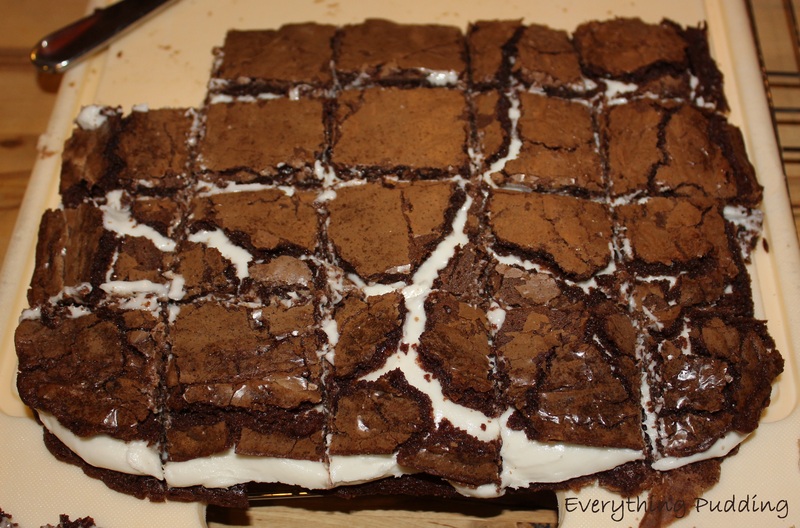 Unfortunately, when we cut the brownies they started cracking really bad and didn’t look to pretty anymore. They still tasted amazing though. When I first read the recipe and realized what size pan it used I didn’t think it would make 20 brownies. However, the brownies are real rich with all that filling and cutting them into 20 made them the perfect size, though I will admit I had more than one. This recipe was super easy to make and I loved it. I can’t wait to make it again. Make them yourself by grabbing the recipe from Cookies and Cups. I already established the fact that I don’t like cereal that much but I also thought I didn’t like granola either. However when my mom made it probably 6 months ago I realized that I really did like it. So now when we have any granola I eat it for breakfast. Of course I still don’t like cereal so I don’t have mine with milk; I drink my milk separately. Since realizing what I’ve been missing I have made granola twice. It hasn’t lasted long either time. In fact this time more than half of it was gone by the end of the day I made it (this was due in part to the fact that we sent some of it to my aunt, but that didn’t account for all of it). It’s a super simple recipe though and cooks fast so its no big deal making another batch. This recipe came from a friend but we modified it slightly. It’s original name was “Quick and Easy but Delicious Granola”. I though that was a bit long and so I shortened it, though the truth remains, it is delicious. The original recipe says 1/4 to a 1/2 cup of nuts, we made it 1 cup because we felt like less than that wasn’t enough. We typically use pecans or walnuts but you can also use almonds. One recipe will fill a half sheet baking pan (13″ x 18″) but we usually double the recipe and fill two pans. It goes pretty quick at my house so two batches at a time is necessary. Granola is super tasty and great for breakfast or for a snack. We like to scoop them up using the 3 oz. paper Dixie cups, though they typically get refilled several times. Want to make your own? Read on for the recipe or download the PDF by clicking here: Quick and Easy Granola. Melt honey and butter together. Pour over oats, coconut, and nuts in large bowl. Stir well to coat. Spread on a rimmed baking sheet. Cook at 400° for 9 minutes, stir, and then cook for another 4 minutes or until medium brown. Remove from oven and let cool 1 hour. Break into chunks and store in airtight container. There are some days when you just need Chocolate. Yesterday was one of those days. I was in the middle of studying for a science test and I really needed (ok, wanted) a break and some chocolate. So I made one of my favorite cookies: Dakota Cookies. These cookies are so great when you want a break from traditional chocolate chip cookies. They have rice crispies and oatmeal which gives them a nice texture. They’re also super quick and make a great size batch. So the next time you need some chocolate whip up a batch of these. You can download the PDF recipe by clicking here: Dakota Cookies. Enjoy! Cream sugar and butter. Add eggs and vanilla. Sift dry ingredients and add to creamed mixture. Add oats, crispies, and chocolate chips. Drop by spoon onto cookie sheet. Bake at 375° for 7-10 minutes. Cool and enjoy! Recently we had a covered dish supper with some families from our church. It was a small group and we wanted to make sure everything got covered: desserts, sides dishes, casseroles, etc. So my mom, older sister and I got in the kitchen and got busy. I volunteered to make dessert (the cook gets to taste test right?). Being that I am not always in the mood for cookies and that we wanted something that would make a lot, I chose to make one of our favorite recipes: Butterscotch Chewies. I made two pans and since we served them on a plate, I got to taste test before hand. The dessert was a hit, I think we only brought home 4 or 5 and with two pans we took almost 48. Sounds like it was a success. Melt butter in saucepan. Add brown sugar and bring to boil over medium heat, stirring constantly. Cool slightly. Add eggs one at a time and mix well. Add vanilla, flour, and baking powder. Stir in nuts. Grease 13 x 9 pan, and add batter. Sprinkle with chocolate chips. Bake at 350 degrees for 22-25 minutes. Cut when cool. Makes 24 bars. When you read the title most of you were probably like, what? Beans and brownies don’t go together, except they do. I was introduced to these brownies at a recent NCFCA tournament. During the down time between rounds I noticed a friend at my table eating something and I asked what it was. She said it was a black bean brownie and offered my one. I said no! Later I decided to try one and was totally surprised, they were so good. So after having a couple days to recover from the tournament we got the recipe and made a batch (actually two!). Unfortunately I let the secret slip about what was in the brownies (we were originally going to give the brownies to my younger siblings and then tell them what was in them). Everyone did try them and all but one person in my family like them (more for the rest of us I guess). Though I must admit my regular brownies are better than these, these are definitely better when you consider how much better for you they must be. These are incredibly simple and you can’t even tell they have black beans in them! Hopefully you’ll be brave enough to try these brownies by using the recipe below or by downloading the recipe by clicking here: Black Bean Brownies. Add all ingredients to a blender and blend on low until all ingredients are well blended (there should not be any whole black beans in the batter!). Lightly grease an 8×8 baking dish and pour batter inside. Bake for 25 minutes, until toothpick comes out clean after inserting in the center. Cool for 30 minutes before cutting and serving (otherwise they will fall apart). For a double recipe use a 13×9 pan. If your oven tends to cook faster be sure to check the brownies a couple minutes before the 25 minute mark.